It’s the season of gifts, decorations and celebrations and as always, this month of festival has a lot to offer. Christmas is all about an entire world going on holiday, and shopping, partying and get-togethers. The best part is the Christmas of giving! Don’t we all love to give gifts to our loved ones, especially children? Well, while technology doesn’t have anything major to contribute to your vacations or fun, yet it tries to be a part of your happiness and enjoyment through various means. Christmas is indeed a big day and Christmas Countdown 2017 helps you keep a track of the countdown. The app alone is sufficient to make the big day special for you with the features like HD wallpapers, classic music and some widgets. Although, the app doesn’t have anything fancy, the countdown timer and the widgets fill the vacant. Google Santa Tracker is one of the most amazing Santa tracker app that provides you with many fun activities and games for children. Apart from the countdown timer, it also has Android Wear support and Google Cardboard VR support. The best part of Google Santa Tracker is that it is absolutely free and contains no advt. 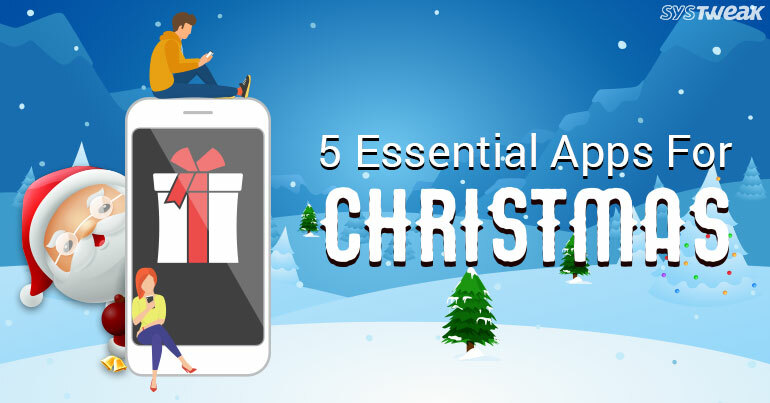 Must Read: 5 Apps To Get You In The Christmas Spirit! If you’re looking forward making your Christmas a bit musical, iHeartRadio is the best app to go for. The app consists of a range of holiday mood radio stations to play new and old hit tracks for you. The app does have a few advertisements alongside, but is completely free of cost, which is good. If you’re not too much into technology and like your music to be on its own, iHeartRadio gives you the liberty of plug-n-play. Just launch the app, search for Christmas and relax. Christmas may be a holiday but it doesn’t leave you any moment of free time. There’s a lot of things which you’ve to complete or start to make the big day special. However, among the pile of tasks, you may forget to attend something important. It may be an appointment, a meeting or anything. TickTick app comes into the picture when you’re too busy to remember your schedule. It reminds of your to do lists that you’ve to complete by the end of the day. No, not the Brazilian rainforest but the world’s leading online shopping website Amazon is another essential app for Christmas. As the festival is of giving and receiving gifts, Amazon is one of the best places to buy them. If we talk about offline market, you may not get the adequate variety of the things that you wish to gift your loved ones. Here, you’ve the world’s biggest store right on your palm. Not just to buy things, it also helps you get the idea from the range of units available. You’ve got everything to make this Christmas worth cherishing. You may select any of the above apps based on the theme and mood you’re want to set for the festival. If you’re more into shopping, there’re many more options to consider. For those who have children at home, you now have the option to entertain them with the apps.